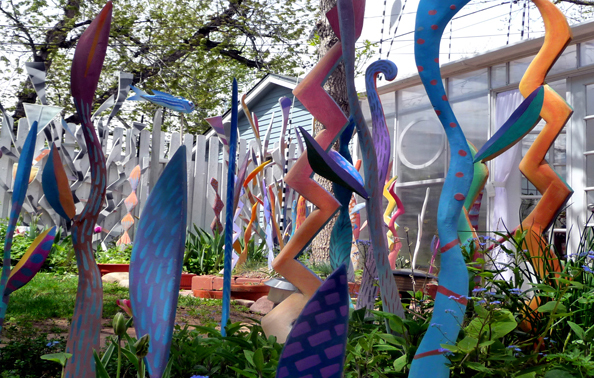 Grab your spring-fever and take yourself on a tour of enchantment through the eccentric gardens of 15 Boulder artists. Visit the Boulder Public Library Canyon Gallery and see how 30 painters, photographers and sculptors were inspired by these 15 artists’ gardens. Then head home and plant seeds of inspiration in your own garden! Sunday JUNE 12th 2011, 11am – 6pm. 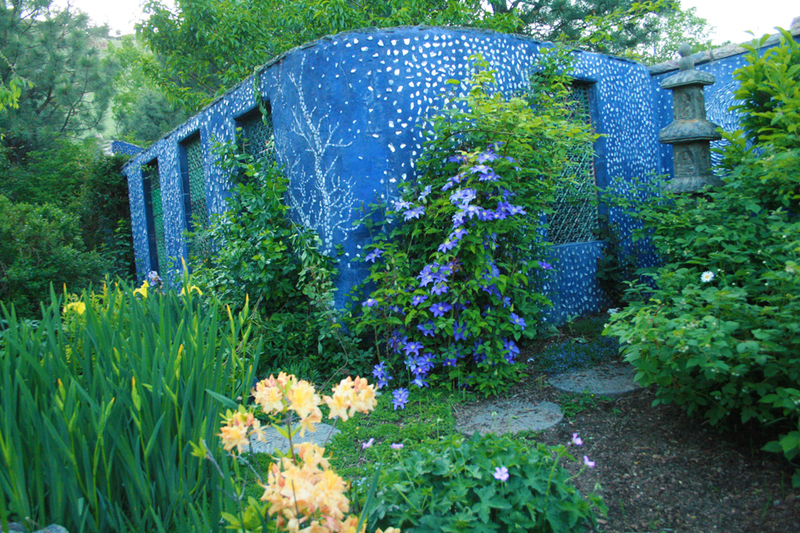 Buy a map-guide for $10 and tour the gardens of 15 Boulder artists. All gardens are free and open to the public. Map-guide sale locations: Boulder Arts & Crafts Co-op, Sturtz & Copeland, Piece Love & Chocolate, Indochine. MAY 31st through JULY 10TH, 2011. The Canyon Gallery of the Boulder Public Library, 1000 Canyon, Boulder, CO (303) 441-3100. Hours: M-Th 10am-9pm; F, Sa 10am-6pm; Su 12-6pm. Opening Reception: Friday, June 3rd, 5 – 7pm. For the past year, 15 Boulder artists have opened their gardens to 32 painters, photographers and sculptors. Inspired by these 15 gardens, the exhibiting artists created new work which will be on display at the Boulder Public Library from May 31st – July 10th. On June 12th, the public will have their own chance to tour these 15 gardens, meet the artist-gardeners, and talk to painters demonstrating plein-air painting in the gardens. From baroque to eclectic, from funky to elegant, these gardens span all styles and offer many ideas to gardeners searching for inspiration in their own spaces. Our mission is to cross-pollinate the visions of gardeners with those of artists, and to germinate seeds of inspiration, which will sprout into artistic flights of fancy in your own garden. Please join us. You may find that your own garden and life will change! As a part of the Eccentric Artists Gardens Exhibit at the Library, the Eccentric Artists are tackling the issue of what Front Range gardeners can do in their own back yards to adapt to and mitigate climate change. Visit the exhibit at the Canyon Gallery of the Boulder Public Library or our website, and learn how to turn your yard into a carbon-munching machine! See examples of Climate-Wise gardening practices in other Boulder gardens on the Eccentric Artists’ Gardens Tour on June 12th. The Eccentric Artists decided to take on the topic of Climate-Wise Gardening because it is timely and there is not a whole lot of information about it. We have outlined 10 easy guidelines which gardeners can follow to become “Climate-Wise.” Many gardeners will find that they have already been doing some of these things, and they should be commended! New gardeners will find lots of new ideas to try out. The guidelines are all inexpensive, non-capital-intensive solutions. I have designed, written and produced this exhibit. To present the guidelines, I have created a character named Climate Wise-Guy, who is designed to be friendly, non-threatening, comforting and wise. Climate Wise-Guy, along with his dorky side-kick Little Bunny, is able to present disturbing information in a non-threatening way, so people can hear it better. 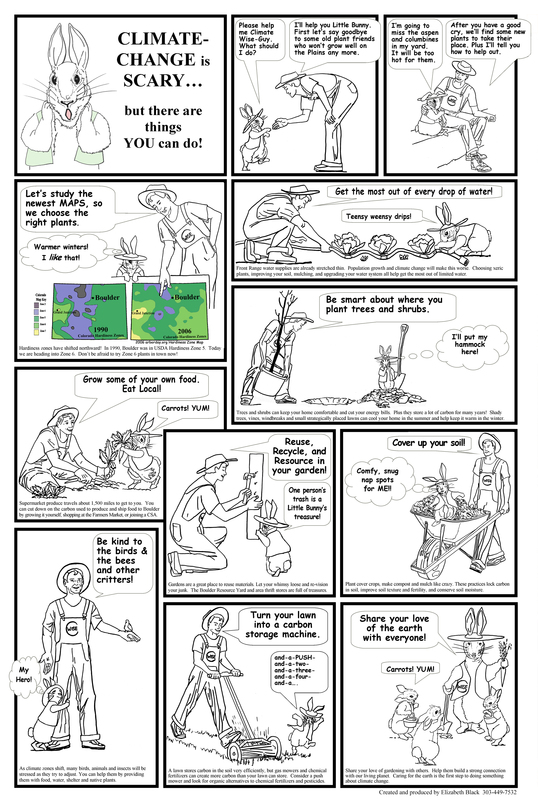 My drawings of Climate Wise-Guy and Little Bunny are available for free to use in educational material about climate change. Contact me at 303-449-7532 or Elizabeth@ElizabethBlackArt.com if you want to use Climate Wise-Guy in your own educational campaign.